While I was away on holidays I had the chance to catch up on some reading while reducing the pile of books that were sitting beside my bed. One of those books was The Mentor Within written by Rosemary Shapiro-Lui. I have to say that I thoroughly enjoyed reading this book and got a lot of great information out of it. Rosemary was born and raised in apartheid South Africa into a socially conscious family. She began her career a a social worker in the gang-ridden communities of the Cape Flats working with NICRO, a crime prevention organisation. Her roles were key to transforming the juvenile justice system for the country (assisted by a chance meeting with Nelson Mandela). Since migrating to Australia Rosemary continues to facilitate change and leadership but now she is doing it for entrepreneurs, solopreneurs and social entrepreneurs, coaches and mentors. She has also founded a cyber Global Walking Group and is passionate about Argentine Tango. Rosemary’s book not only tells her story it also gives you step by step instructions on how you can conquer your internal chit chat (the “Monster Within”). It helps you to reconnect to the part of you where your wisdom and passion is. As an added bonus this book is illustrated by Zapiro who is South Africa’s best-known and most awarded cartoonist, he also happens to be Rosemary’s brother. I recommend this book for anyone who struggles with the internal chatter and monsters that disconnect you from your inner wisdom. I often speak about the ‘knowing and trusting’. 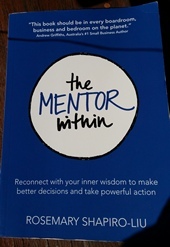 That all of the answers are inside you and this book helps you find your own internal mentor. Thanks Rosemary for not only sharing your story but also for sharing your knowledge with the world.